At Pasadena CyberKnife Center, we are experts in treating virtually every form of cancer! Our team of doctors and radiation oncologists are experienced in combating a wide range of cancerous tumors, using world-class technologies to offer a comprehensive, non-invasive, and convenient treatment plan. Kidney cancer is among the most common cancers in America for both men and women, and with Pasadena CyberKnife, we can provide an effective treatment without putting your body or your kidneys at risk. Traditionally, oncologists would rely on surgery or chemotherapy for kidney cancer treatment – but Pasadena CyberKnife offers a new solution! Rather than invasive surgical methods, our CyberKnife system uses powerful radiosurgery techniques, delivering high-dose radiation directly to the site of the tumor with sub-millimeter accuracy. CyberKnife lets our team treat kidney cancer with an outpatient procedure that minimally impacts your day-to-day routine and provides a high success rate. Pasadena CyberKnife brings together some of the most advanced stereotactic radiosurgery technology on the planet today to create one of the most advanced cancer treatment methods on the market. Thanks to its use of the Synchrony Respiratory Tracking System, CyberKnife is the only radiotherapy system today capable of tracking and compensating for a tumor’s movement in real time. Sub-millimeter accuracy of radiation delivery, providing maximum dosage with minimal exposure to surrounding cells and tissues. 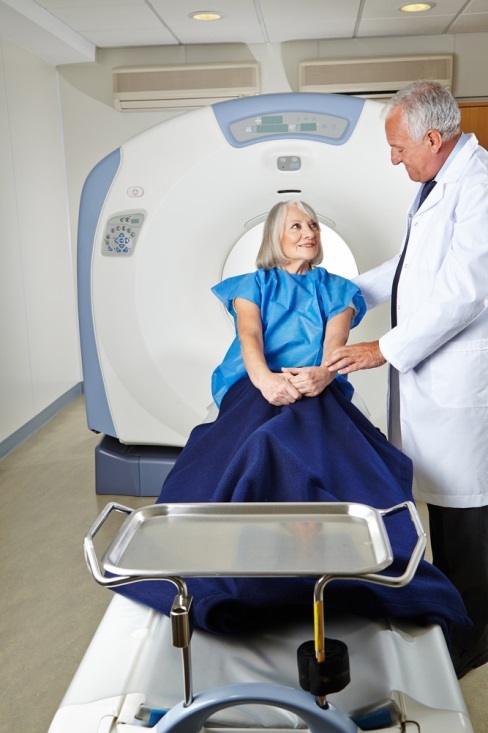 Real-time imaging, tracking, and adjustment for tumor motion to ensure accurate radiation delivery. Completely non-invasive and non-surgical, providing minimal side effects and improved recovery time. Treatment on outpatient basis which requires no hospital stay and lets the patient continue with their daily routine after treatment. Radiation delivered in 1 to 5 treatment sessions over the course of a week. Because the kidney is located so close to the lungs and the bowels, the tumor moves constantly from regular, involuntary functions like breathing and movement of gas through the body. To deal with this movement, many radiosurgery systems require the use of braces and uncomfortable immobility devices to stabilize the tumor – and even then, accurate delivery is never guaranteed. CyberKnife completely does away with the need for braces and immobility devices! Using advanced imaging and motion tracking software, CyberKnife is able to measure the tumor’s movement and account for it in real time, ensuring continuous, accurate radiation delivery throughout the entire treatment session. This tracking capability means the patient never needs to wear a brace or immobility device – all you have to do is lie comfortably while CyberKnife delivers treatment. Treatment is completed on an outpatient basis, and patients are free to go about their lives as normal following a treatment session. The sessions last about an hour, and most patients complete their recommended dose of radiation in 1 to 5 sessions over the course of a week. Truly, CyberKnife offers a convenient, effective treatment for all forms of kidney cancer! As with all forms of cancer, prevention or early diagnosis offers the best chance for successful treatment. When caught early, most tumors respond well to CyberKnife radiation therapy. However, when you choose Pasadena CyberKnife for cancer treatment, we can often treat more aggressive or metastatic forms of cancer. No matter how serious your condition or what you’re up against, the team at Pasadena CyberKnife Center is committed to helping you thrive. Get In Touch With Pasadena CyberKnife For Kidney Cancer Treatment Today! If you or a loved one have recently been diagnosed with kidney cancer, we know how scary that feeling can be – and we’re here to help. At Pasadena CyberKnife Center, we’ve helped countless patients beat cancer and reclaim a healthy body and a happy lifestyle, and we would be thrilled to help you do the same. If you’re ready to take the fight against cancer back into your own hands, don’t wait: call us today at (626) 768-1021, or reach out to us at our contact page. We can’t wait to hear from you!